If you read my post about Summer Sewing Projects, I plan on sewing basics for my wardrobe, things I can wear everyday! I also like trying to highlight the many pattern lines we carry on our website. So one evening I was thinking about new ideas for the blog and I decided to do a series of interview and review posts about the Indie Pattern Designer's lines that we carry! So not only am I building my wardrobe, but showing how you can do it too with Fabric Mart fabric AND our line of patterns! 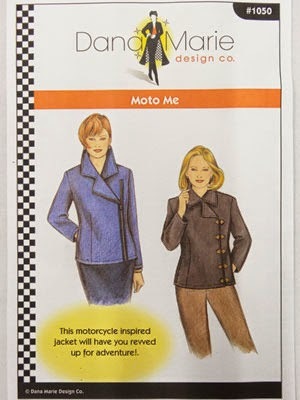 This week's featured pattern designer is Dana Bontrager from Dana Marie Designs. I have worked with Dana for a few years now, providing her with fabric for the International Textile Expo Fashion Show. The International Textile Expo is a wholesale fabric show where designers, manufacturers and fabric stores source fabric, trims, buttons and other finds. Dana graciously volunteered to be the first designer to be highlighted! It worked great because I was working on one of her patterns to be reviewed on the blog. 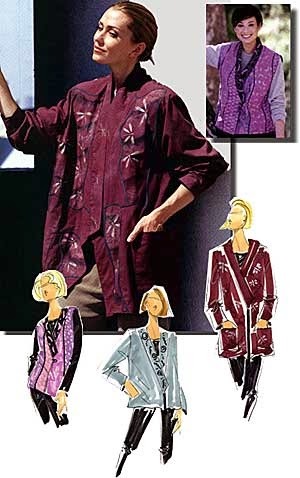 Dana started her business in 1985 creating custom designs and pattern making for clients and small manufacturers. Today, her business includes her own line of fashion patterns, art stamps and fun toys to have your own wearable art experience. Many of her patterns have a range of sizes XS-5XL. See specific patterns for details. I’ve made a career of “thinking outside the fashion box”, constantly stretching design and sewing conventions to develop new skills and creativity. 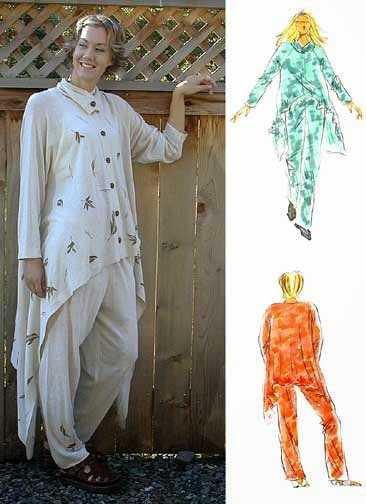 Working from my studio in the Pacific Northwest, I create unique, eye-catching garments that are both casually simple and wonderfully imaginative. Always an enthusiast for the unusual, I design pieces that are often whimsical, using a variety of 'materials' to create a certain expression. Coffee (the best work days are ones started well caffeinated), sorting through emails, taking care of paperwork, orders, requests, etc. Then it’s working on whatever challenge is next. Sometimes that is preparing for an upcoming event with samples to be made, other times it is working on new ideas for future product. After years of doing custom work, and pattern making for small manufacturers, I wondered if anyone would actually buy my designs as a paper pattern to be sewn. At the time, there were only commercial patterns available (Vogue, McCall’s, Simplicity, etc.) and a smattering of independents. I decided to try it by offering them in a friend’s booth at a large sewing expo. We sold out, so I figured I must be on to something. I am pretty much self-taught when it comes to fashion design, my college degree is in Art, but textiles is my medium of choice. When I needed to learn something I was not very comfortable with in regards to fashion design, I found the most skilled individual in my area at what they did (flat pattern drafting, fashion illustration, etc.) and learned directly from them, this was with Terry Horlamus and the New York Fashion Academy in Seattle. My dad was a boilermaker and I remember from a very young age going over blueprints with him of boilers (not the most exciting item but it came in handy when learning drafting later on). My mom was an imaginative and creative thinker (which helps me step outside the box and gifted me with the ability to visualize how to create from only an idea), so I guess I have the right genes for this work. I learned to sew from my mom and the beginnings of patternmaking from watching the modistas in Spain chalk right on the fabric they were making in to garments, no paper patterns were used. I’ve had the best luck with going what I’m in the mood for or need next. If I want an outfit for an event, I may draft something new to wear. If the response is exciting and positive (as in, “Where can I get one!”), then I think this just may be a good pattern to release. Many times it is the consumer themselves who ask where they can get a certain design. If I see a need for that in the independent pattern offerings, then I consider it for my line. I also love challenges, so creating pieces that look difficult, but are easy to construct is a favorite of mine. I see a big difference between your original collection of sewing patterns versus the patterns that have come out in the past few years. Can you tell us more about that? As in all things, we evolve. From our tastes in design, to our skills to create. While I rarely follow trends, I am enough of a businessperson to pay attention to the marketplace. I try to produce what will sell, while still offering something unique and appeasing my own sense interest in what I do. I don’t know that I have one favorite. I love the complexity of Issey Miyake and the shape and form of Claude Montana. The best thing is having the skill to create what I see in my head. The hardest thing is struggling to create what I envision. It is a lot of trial and error, but most often, that leads to something more exciting. Oh, that changes with each new creation! However, for a perennial favorite, it has to be the Kimono Jacket. Its clean simple lines make it a great canvas for all kinds of embellishment, piecing or just using fabulous fabric. It looks good on all types of body shapes and it’s quick to construct. Of indie designers, I am impressed with Marsha McClintock of Saf-T-Pockets. Her patterns are fashionable function and that is not always easy to design. A new one I’ve recently had the pleasure of working with is Laura Nash of Sew Chic. I like her retro-vintage look but it also has a modern twist and her attention to detail appeals to the engineer in me. I’d have to say rayon. I love the way it breathes, stitches up, comes in a wide array of prints, solids, textures, and types, both woven and knit. It is versatile enough to work up in a multitude of designs. I have two, a ballpoint awl and my tailor’s points. I use these every time I sew. They make my work efficient and so much easier. The barn. I love horses, so Quincy (my dog) and I, jump in the truck and get some equine therapy. A ride in the countryside is the best way to re-energize and unwind. Coffee. Seriously, I like all kinds of stuff, but I’m crazy about fruit, and if you happen to put that in a pie, we’re friends for life. “Where do I find all the great fabrics you use?” I am lucky enough to be in an industry where I have access to all kinds of fabrics, but I also do not limit myself to just what is considered ‘normal’ for sewing. I like to step outside the fashion box and sew with unusual materials or use fabrics tasked for another industry other than clothing. Most commonly home-dec fabrics for garments, but I’ve also made clothes out of surveyors tape. Fun colors and it doesn’t ravel! I love asymmetry, clean crisp lines, and edgy looks without looking like a costume. I am not a big fan of big frothy ruffles or glitz and bling, but I like it in small detail areas. I prefer the unexpected, so I don’t always pay attention or follow trends. Individuality is more important to me than trend, so if it happens to be ‘on trend’ fine, if not, it will be eventually. That’s the beauty of fashion; it is constantly changing, evolving, and cycling. Thank you Dana for sharing with us! You can see all of Dana's patterns on her website: www.danamarie.com. You can also purchase selected patterns from our website. Stay tuned, I will be posting a review on the pattern, A Right to Bare Arms over the weekend!